Is Valkyrie Returning in Avengers 4? Chris Hemsworth and Tessa Thompson took a private jet from London to Atlanta for Avengers 4 reshoots. The two were previously filming the upcoming Men In Black movie and are taking a break to finish up the next Avengers film. Hemsworth said that he was returning to Atlanta for the reshoots on social media, but it is unclear if Thompson is reprising her Thor: Ragnarok role as Valkyrie for the highly anticipated Avengers sequel. 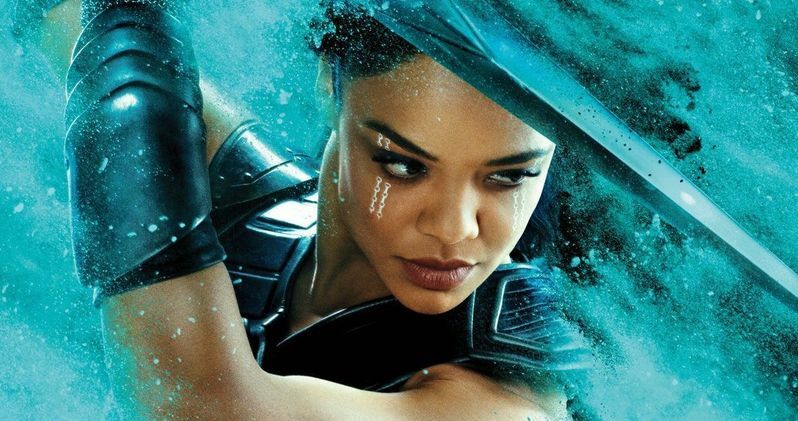 Tessa Thompson's Valkyrie was one of the bigger absences from Infinity War and Marvel Cinematic Universe fans have been waiting to see if she'll show up in Avengers 4. Since Thor: Ragnarok leads right up to Infinity War, many just assumed that she was going to be in the film, but she was nowhere to be found, which led to some disappointment. Some even feared that she was dead. However, the Russo Brothers along with screenwriters Christopher Marcus and Stephen McFeely recently confirmed that she is alive and well. Chris Hemsworth posted some stories on his Instagram feed yesterday that had him detailing the rest of the Men In Black filming in exotic locations. He also revealed that he was heading to Atlanta for Avengers 4 reshoots, and then he and Tessa Thompson boarded his private jet to Atlanta. Thompson also posted stories to her social media feed as well and then the two were spotted at the Atlanta airport. This does not confirm that Valkyrie will be in Avengers 4. Thompson could have just hitched a ride on the private jet to get to the United States quicker or to attend to other business affairs in Atlanta. It's worth noting that Tessa Thompson was spotted at the Durham Cathedral in Durham, England where Marvel Studios was filming in early 2017. Mark Ruffalo and Chris Hemsworth were also on the set. It's unclear what that set was used for, but the Russo Brothers later posted a picture from the same set, leading many fans to believe that it was used for Infinity War or Avengers 4 shoots. The Russo Brothers have since deleted the picture. It's also possible that the directing duo were visiting the set that was being used for Thor: Ragnarok reshoots. Avengers 4 is already adding characters that were not present in Infinity War, so we could very well see the return of Valkyrie to help fight Thanos. Captain Marvel, Ant-Man, and Hawkeye are all going to lend a hand this time around to help bring back the half of the universe that was dusted by Thanos. Pictures from the Atlanta set have been leaking lately, so maybe we'll get some more concrete proof of Tessa Thompson's involvement with the project in the next few days. You can check out some of the social media stories from Chris Hemsworth's Instagram page and then some screenshots below.